Release angle (horizontal) - can tell you whether a shot was on target (e.g. wide left, wide right, or on target). Release position - where precisely on the court the player releases the ball. Approach angle - At what angle, relative to horizontal, the ball approaches the hoop. Approach position - where the ball crosses the plane of the hoop (i.e. a PitchF/x view of shooting). This initial post will focus largely on the first metric: vertical release angle. From a purely geometric perspective, it would seem a shot with a higher release angle (and higher arc) would have a better chance of going in. Shots with high arc approach the hoop at a more direct angle, making the hoop appear larger. But shooting is as much about physics as it is about geometry, and a high release angle comes with a penalty: speed. As release angle increases, more speed is needed in order for the ball to reach the hoop. And presumably, a greater release velocity will be harder for the shooter to control, and lead to less accurate shooting. In addition, a higher release velocity also leads to a higher approach velocity, which decreases the likelihood of a friendly bounce for a slightly off-target shot. The chart below illustrates how these tradeoffs play out for a typical 6'3 shooter. "Effective hoop area" is a measure of how big the hoop appears, expressed as a percentage of the hoop's full surface area. Effective hoop area steadily increases with launch angle (illustrated to scale on the chart at five degree intervals). In contrast though, required launch velocity is minimized at about an angle of 50 degrees. Releasing the ball with a lesser angle has no advantages, as speed increases (bad) while effective hoop area decreases (also bad). So far, this is all theoretical. 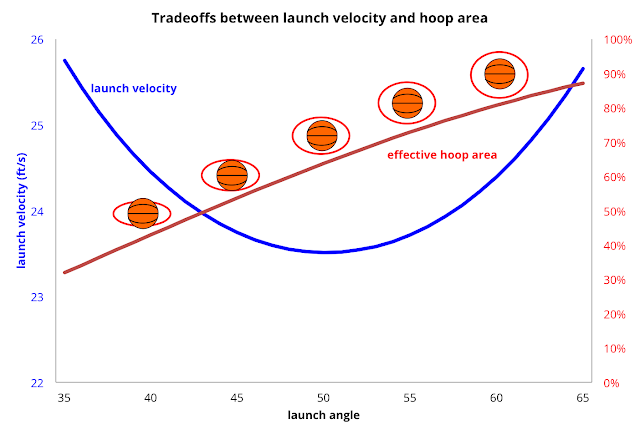 Isaac Newton can tell us what the tradeoffs are between release angle and speed, but we need the SportVU data to tell us how NBA players balance those tradeoffs in practice. The blue line in the chart below shows how release speed and hoop area relate to each other as you adjust launch angle. 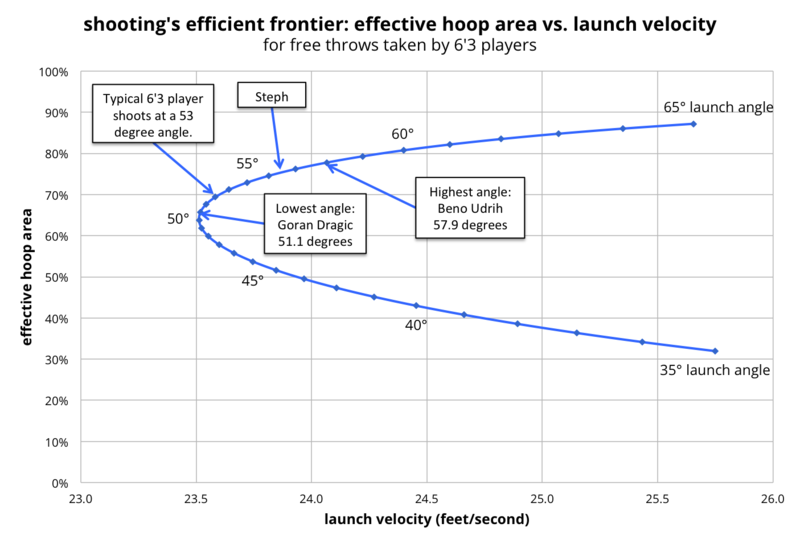 What emerges is an "efficient frontier" of sorts for free throw shooting. And we can now see where NBA shooters place themselves along that frontier, crafting their own risk/return balance in the process. 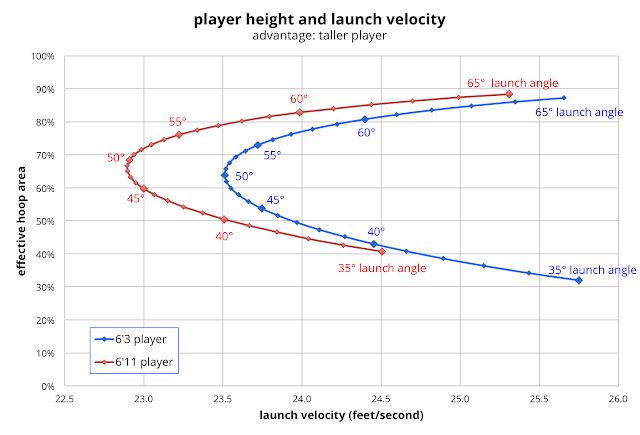 On the chart, increasing launch angle is equivalent to traveling along the blue line. Imagine you are a shooter that has chosen a launch angle that minimizes release velocity. 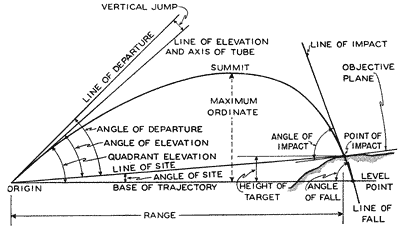 You would find yourself on the leftmost point of the shooting frontier, with a launch angle of 50 degrees and a launch velocity of 23.5 feet per second. But this point on the frontier is where the tradeoff between velocity and hoop area is at its most forgiving. Tilting your launch angle up from 50 degrees to 55 degrees gets you 9% more hoop area with just an 0.2 feet per second increase in required velocity. But those returns diminish as you move further along the frontier. That first incremental 9% of hoop area came cheap. The next 9% increase in area will cost you an additional 0.9 feet/second (a 450% inflation rate). The geometry of the shooting frontier can help explain why players choose the launch angle they do, and why they don't choose to just minimize velocity. The typical shooter is willing to tilt their shot up a few degrees because the gains in hoop area appear to be worth the minimal loss in accuracy stemming from higher shot velocity. From the previous chart, note that Steph Curry, a 90% free throw shooter, is at the high end of the launch angle range (second only to Beno Udrih). Udrih is also an above average free throw shooter at 84%. Perhaps a high arc is the secret to good free throw shooting? 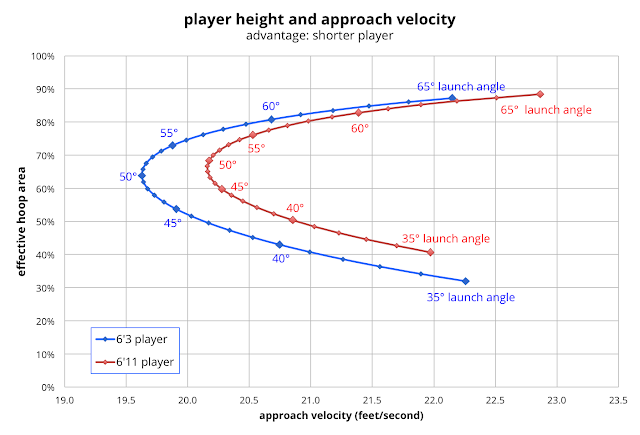 The chart below summarizes launch angle for all players with a minimum 75 attempts over the past three seasons. In addition, the top 20 shooters are shown as green dots and the bottom 20 shooters are shown as purple dots. From this data, it does not appear that a high launch angle is the key to making your free throws. 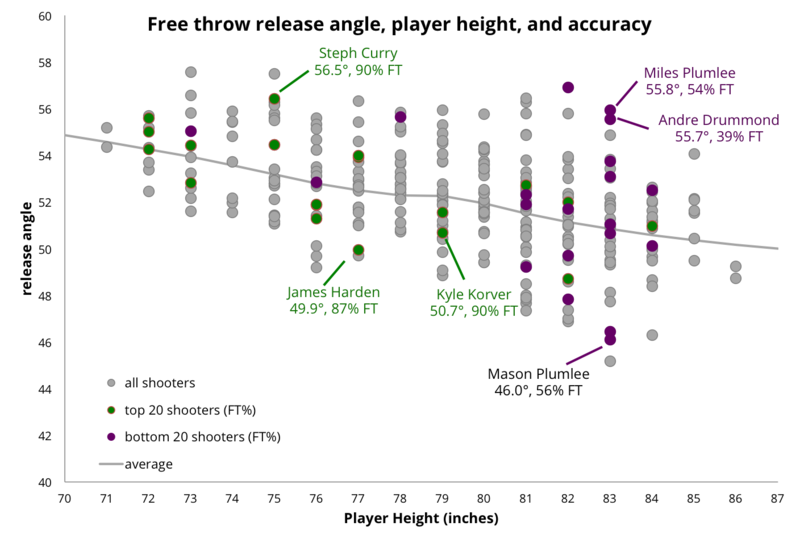 Two of the best shooters in the league, Kyle Korver and James Harden, have lower than average launch angles for players of their height. And Andre Drummond, the league's worst free throw shooter, has a very high release angle. The Plumlee brothers, Miles and Mason, make for an interesting contrast. Same height, same parents, similar free throw percentage (bad), yet markedly different shooting mechanics. At 55.8 degrees, Miles has the highest release angle of 6'11 NBA players. His brother's median shot angle is nearly a full 10 degrees lower. Yet both brothers are poor free throw shooters, making just slightly more than half their attempts. If you run a proper linear regression on free throw percentage, using player height and release angle as independent variables, it turns out that the coefficient for release angle is slightly negative. In other words, for a given height, players with a lower release angle tend to have slightly better results. This result is significant at the 1% level, but the overall effect is still relatively small. A reduction of one degree in release angle is associated with an 0.6% improvement in free throw percentage. I think the main takeaway from the data is that shot angle, within a reasonable range, is a matter of shooter preference. You find good shooters and bad shooters at both ends of that range. Returning to the chart above, note that the poor free throw shooters (the purple dots) tend to be the taller players. What can our simple physics model tell us about the challenges taller players face when shooting free throws? The chart above illustrates two shooting "frontiers", one for a 6'3 player and another for a 6'11 player. Generally speaking, the further left the frontier, the better off you are. It means you can achieve the same effective hoop area with a lower launch velocity. For example, a 6'11 player can achieve a 70% effective hoop area with a launch velocity of 22.9 ft/s. 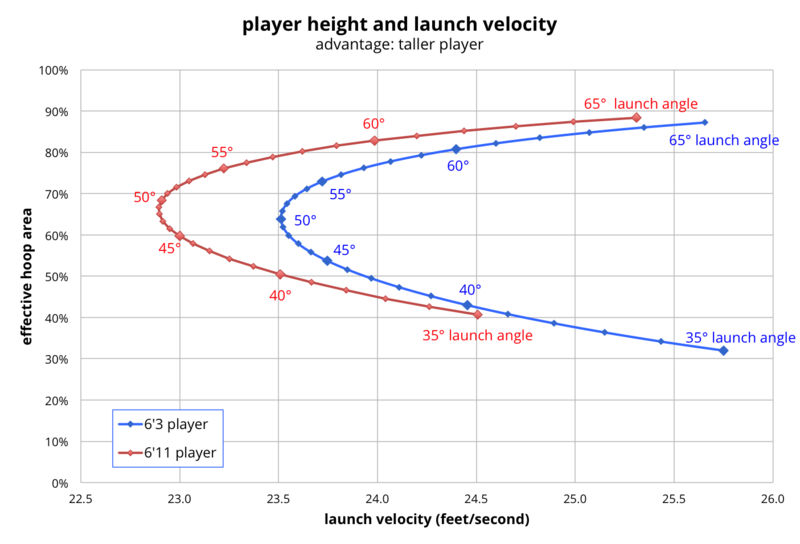 A 6'3 player would need a launch velocity of 23.6 ft/s to achieve that same 70%. However, while taller players have a release velocity advantage, the shorter player holds the upper hand on a different shot metric: approach velocity. The faster the ball approaches the rim, the more likely it is to rattle out, so minimizing approach velocity should improve accuracy. The chart below illustrates the approach velocity shooting frontiers for 6'3 and 6'11 players. Our shooting frontiers have swapped places. For a given effective hoop area, the shorter player's shot approaches the rim at a lower velocity, increasing the likelihood of a friendly bounce. So there are pluses and minuses to being a tall free throw shooter, and it isn't clear to me which is more important: release velocity or approach velocity. I suspect the real reason taller players are poorer shooters has less to do with the physics and geometry, and more to do with the relative size of the talent pool at each height. There are only so many 7+ foot males between the ages of 20 and 40, and 17% of them play in the NBA. That percentage drops to 0.07% for males between 6'6 and 6'8. So, at typical NBA heights, you are getting literally the top 0.1% or better in terms of basketball skills. But for seven footers, you get the top ~15%, so it shouldn't be surprising to see a drop off in basketball "fundamentals". So if a high, arching shot isn't the hidden secret to good shooting, what is? I imagine it comes down to consistency. A consistent shot angle is likely developed over multiple years of practice, coaching, and deliberate adjustments. Minor tweaks to shooting form likely occur at a subconscious level, as the brain subtly re-calibrates after each make and miss, like a World War I artillery gunner. And eventually, muscle memory takes hold, and the act of shooting becomes as rote as climbing stairs or tying your shoelaces. Good shooters don't aim, they breathe through their eyelids, like the lava lizards of the Galapagos. One way to quantify shot angle consistency is to look at the standard deviation of each player's attempts. If the standard deviation is low, that means the player does a better job of releasing the ball at a consistent launch angle. A high standard deviation is a likely indication of poor and inconsistent shooting form. 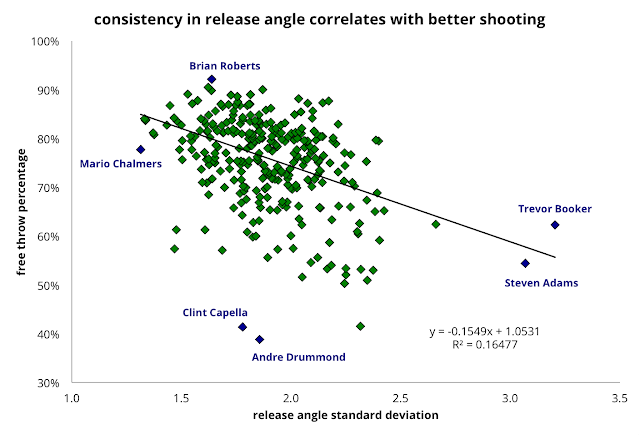 The scatter plot below shows how consistency, as measured by standard deviation, correlates with free throw success. Here we see a clear correlation between accuracy and consistency. Memphis point guard Mario Chalmers leads the league in shot angle consistency, with a standard deviation of just 1.31 degrees. Utah's Trevor Booker and Oklahoma City's Steven Adams have the least consistent launch angle, which may explain their below average free throw percentages. Curiously, Andre Drummond maintains a fairly consistent shot angle, yet still struggles to hit two out of every five foul shots. Andre's problems seem to stem from a lack of horizontal, rather than vertical, control. In future posts, I plan to extend the framework I built here to other facets of free throw shooting (e.g. release height, horizontal launch angle, etc.). All of the data used in this post can be found in the table below. The table is sortable, searchable, and scrollable. Feel free to point out any interesting relationships you notice, either here in the comments, or on Twitter @inpredict.